In all previous posts of this series with the exception of the second part (see related posts below) I have shown alternating labyrinths. In alternating labyrinths the pathway does not traverse the axis. However, there exist also labyrinths in which the path traverses the axis (in multiple-arm labyrinths: the main axis). These are termed non-alternating. 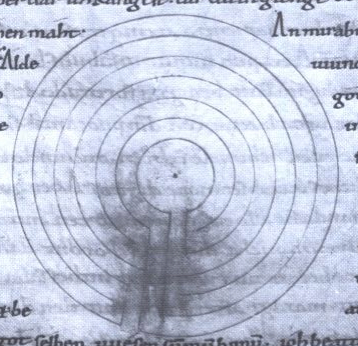 A beautiful example of such a labyrinth is depicted in a manuscript from the 10./11. century of the Stiftsbibliothek St. Gallen. 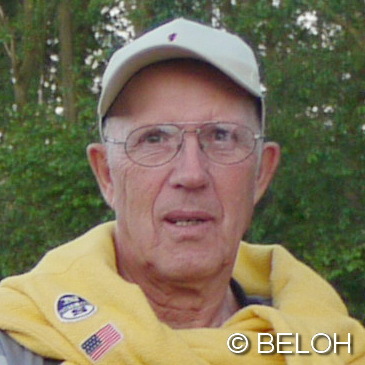 Erwin has already presented it on this blog, and I have published on it in Caerdroia 38 (2008). From part / 2 of this series, we know that in principle also non-alternating labyrinths can be drawn in the MiM-style, as the Snail Shell labyrinth is non-alternating. The pathway of this labyrinth traverses the axis twice. Once when it skips from the first to the second circuit and second when skipping from the second inner to the innermost circuit. The pathway of the St.Gallen labyrinth (ill. 2), however, comes in clockwise from the outer circuit, turns to the right and moves axially to the innermost circuit, where it turns to the left and continues without changing direction (clockwise). 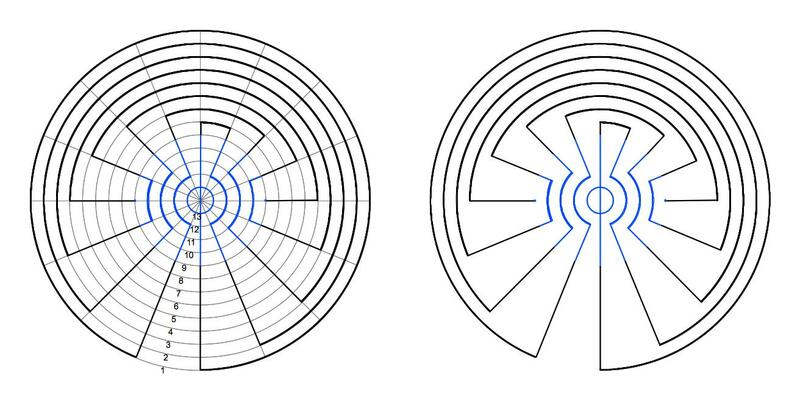 How does this affect the seed pattern and its variation into the MiM-style of this labyrinth? Ill. 3 shows the seed pattern of my demonstration labyrinth from part / 5 of this series (figures a and b) and compares it with the seed pattern of the St. Gallen labyrinth (figures c and d). 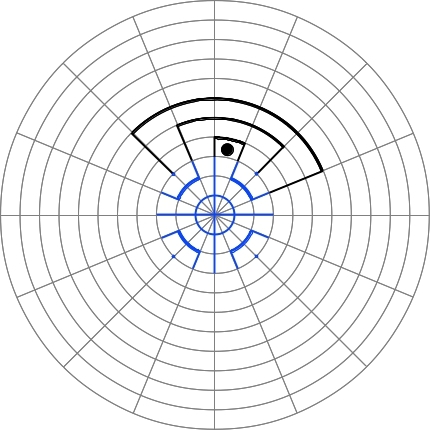 The seed pattern of the demonstration labyrinth has one central vertical line. 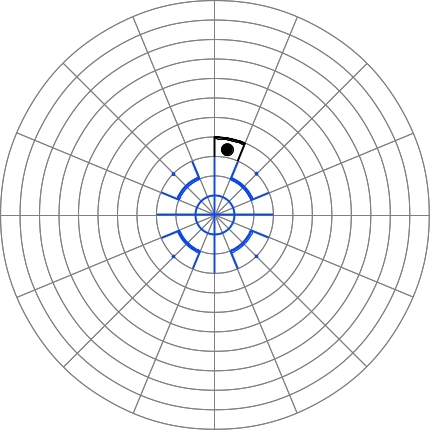 This represents the central axial wall to which are aligned the turns of the pathway (fig. a). This is the case with all alternating labyrinths. Variation of seed patterns of alternating labyrinths into the MiM-style leaves the central line and the innermost ring untouched (fig. b). 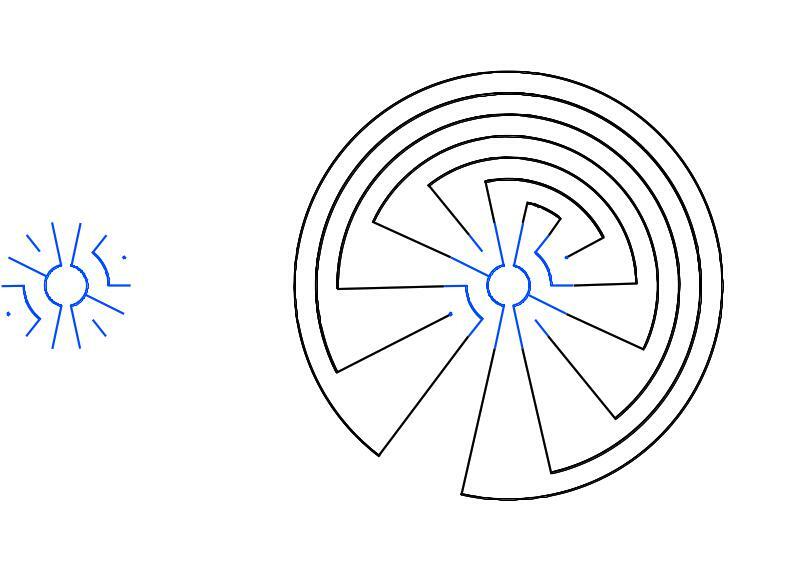 The auxiliary figures of alternating labyrinths all have two vertical spokes and an intact innermost ring. This is different with the labyrinth of St. Gallen. The seed pattern of this labyrinth has two equivalent vertical lines (fig. c). Between these lines the pathway continues along the central axis. If we vary this seed pattern into the MiM-style, we find no central wall and the innermost ring interrupted (fig. d). 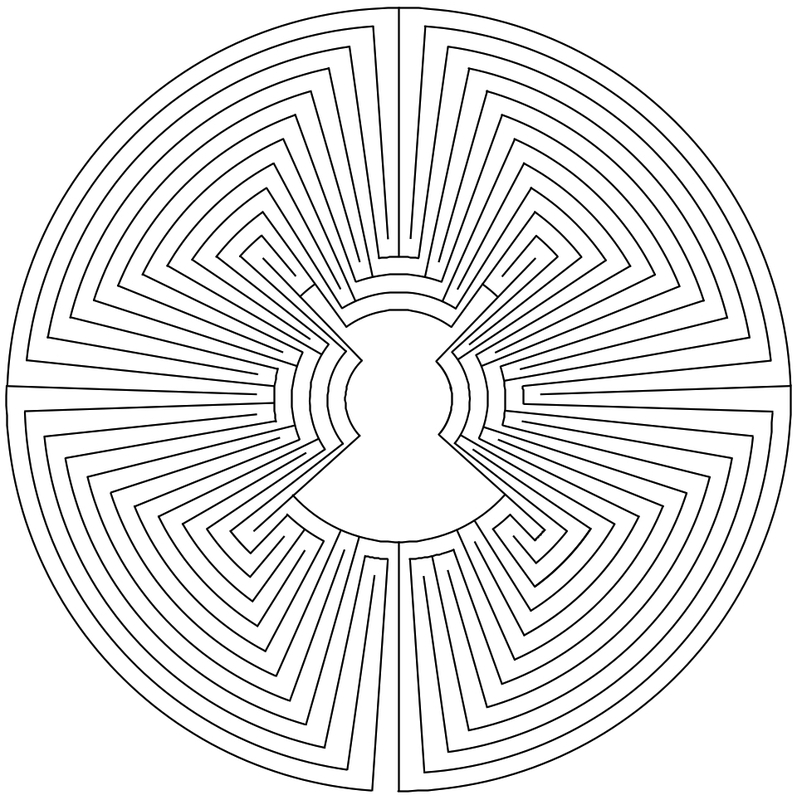 The auxiliary figure of the St. Gallen labyrinth therefore has no vertical spoke. Non-alternating labyrinths can be drawn in the MiM-style in the same way as alternating labyrinths. The seed pattern of the St. Gallen labyrinth has two elements with single and two elements with two nested turns, and in addition the segment of the path that traverses the axis. In the MiM-auxiliary figure this seed pattern covers two circuits. This corresponds with the elements that are made-up of two nested turns. The pathway segment traversing the axis needs no additional circuit, as for this the innermost ring is interrupted to let the path continue through the middle of the seed pattern. And, finally, here is my logo in the MiM-style (ill. 5). In all my previous posts on the Man-in-the-Maze labyrinth I have shown labyrinths with homogeneous seed patterns (see: related posts, below). I term seed patterns as homogenous, that are composed of a series of similar elements. I have shown seed patterns with single (not nested) turns as well as seed patterns with elements of solely two nested turns or four nested turns. The labyrinths of the Löwenstein 3, Näpfchenstein, and Casale Monferrato types and the smaller of the two labyrinths with 7 circuits shown in part / 3 of this series all have single turns (Ill. 1, left figure). The patterns of these labyrinths are made-up of a serpentine from the outside in. The seed patterns of the Knossos, Cretan and Otfrid type labyrinths are composed solely of elements with two nested turns (ill. 1, central figure), see also part / 4 of this series. The larger of the two labyrinths with 7 circuits shown in part /3 has two elements with four nested turns (ill. 1, right figure). Most labyrinths, however, have a mixed – I therefore term it: heterogenous – seed pattern. I will show this here with two examples. The first example is the labyrinth, I am wont to use for purposes of demonstrations, so to speak my demonstration labyrinth. It is this the labyrinth that corresponds with Arnol’d’s figure 5, I have already presented in this post. The seed pattern of this labyrinth is composed of several different elements. The right half consists of an element with three nested turns (ill. 2, right figure). The left half is composed of two other elements. One of it is a single turn (ill. 2, left figure), the other has two nested turns (ill. 2, central figure). How many rings now do we need for such a seed pattern in the MiM auxiliary figure? From the previous posts we know that seed patterns with single turns take one circuit, such with two nested turns take 2 circuits and so forth. Therefore it is reasonable to assume we will need three circuits, as many as are required to cover the three nested turns of the right half of the seed pattern. And indeed this is true. The single turn on top left of the seed pattern covers the innermost circuit of the auxiliary figure (ill. 3, left figure). The two nested turns on bottom left cover two circuits (ill 3, central figure). The three nested turns of the right half of the seed pattern cover three circuits (ill. 3, right figure). Thus, the number of circuits required is determined by the element with the most nested turns. In addition there is another effect on the apparence of the seed pattern in the MiM-style . In heterogenous seed patterns, not all the ends lie on the same ring of the auxiliary figure. (ill. 4, left figure). Despite this, of course, three circuits of the auxiliary figure are needed for the seed pattern. Therefore it makes sense to prolong the ends on the inner rings so that they all end on the same ring of the auxiliary figure. 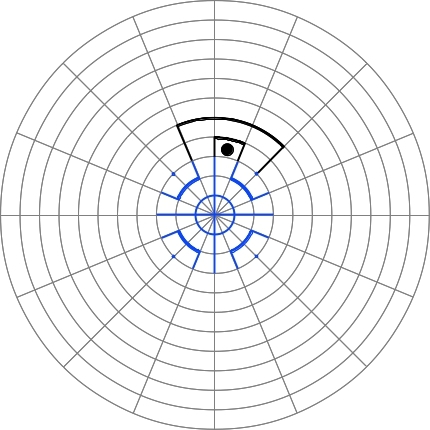 Some of the dots are prolonged to lines and also some of the lines are prolonged (ill. 4, central figure). The result can be seen in the right figure of ill. 4. In order to draw my demonstration labyrinth in the MiM-style, we thus need 5 circuits for the labyrinth, 1 circuit for the center, and 3 circuits for the seed pattern. The second example offers me the opportunity to draw the attention to a very beautiful historical labyrinth. 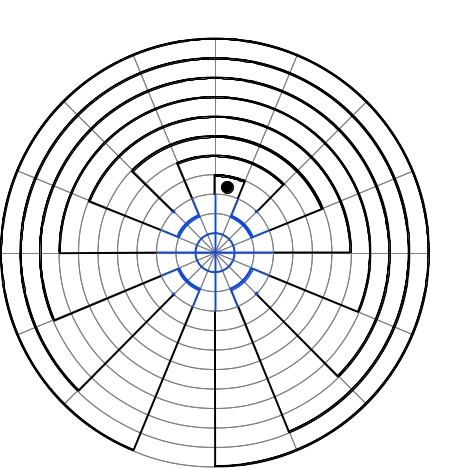 The illustration shows the seed pattern and its variation to the MiM-style of the Cakra-vyuh labyrinth. 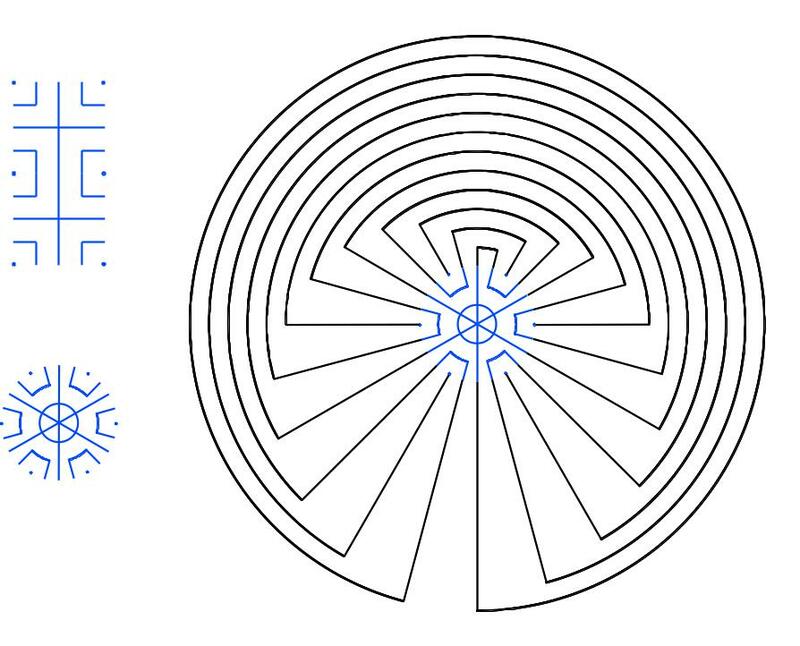 This labyrinth has 11 circuits and is self-dual. However, according to the classification by Tony Phillips, it is an uninteresting labyrinth. Of interest for our purpose is, that the seed pattern of this labyrinth is composed of elements with single (not nested) and with two nested turns. Four of its 24 ends, the four dots, lie on the second innermost ring. The other 20 ends, 16 lines and 4 dots, lie on the third inner ring. The four innermost dots are therefore prolonged to lines so that all ends lie on the third inner ring. 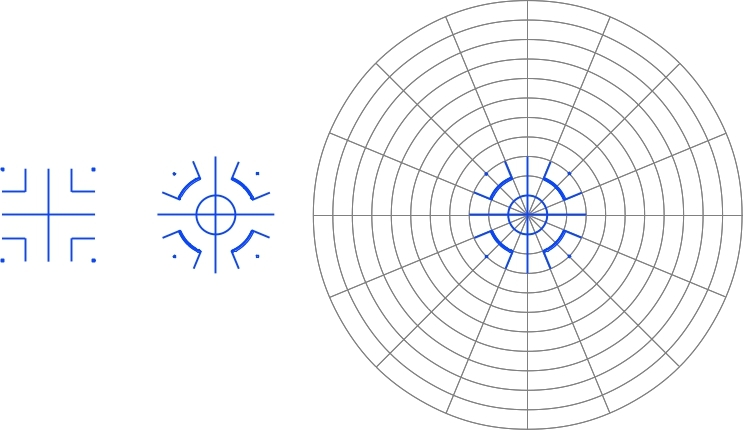 In order to draw the Cakra-vyuh type labyrinth in the MiM-style, an auxiliary figure with 24 spokes and 15 rings (11 circuits for the labyrinth + 1 for the center + 2 for the seed pattern = 14 circuits), i.e. 15 rings is needed. P.S. : Fortunately the seed pattern of the Cakra-vyuh type labyrinth in the MiM-style covers the same number of circuits as the seed pattern of the Otfrid type. So for the drawing we can use the walls (black) of the Otfrid type labyrinth in the MiM-sytle (from part / 4) and only have to exchange the seed patterns (blue). In all earlier posts on this subject I have considered labyrinths with 7 circuits. The auxiliary figures of these labyrinths all have 16 spokes. 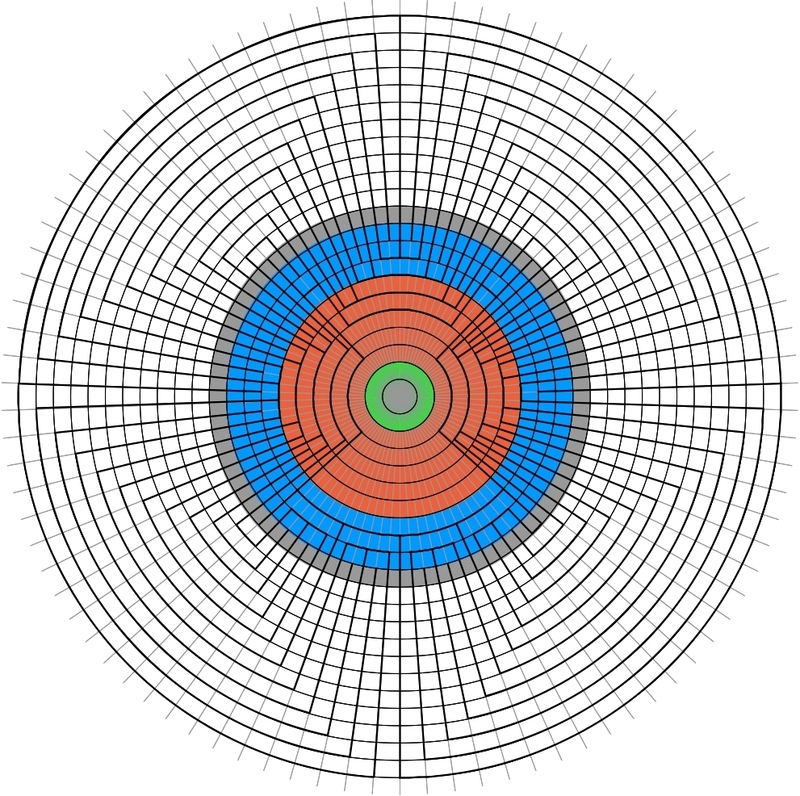 The number of spokes of the auxiliary figure is determined by the number of the ends of the seed pattern. I will show this here for some selected labyrinths with less or more than 7 circuits. The first two examples are the only alternating labyrinths with three circuits. The third is a labyrinth with 11 circuits. The simpler labyrinth with three circuits is of the Löwenstein 3-type. The seed pattern of this labyrinth has 8 ends. The pattern is made-up of a serpentine from the outside in. This labyrinth again contains the smallest possible seed pattern that covers only one circuit in the MiM auxiliary figure. 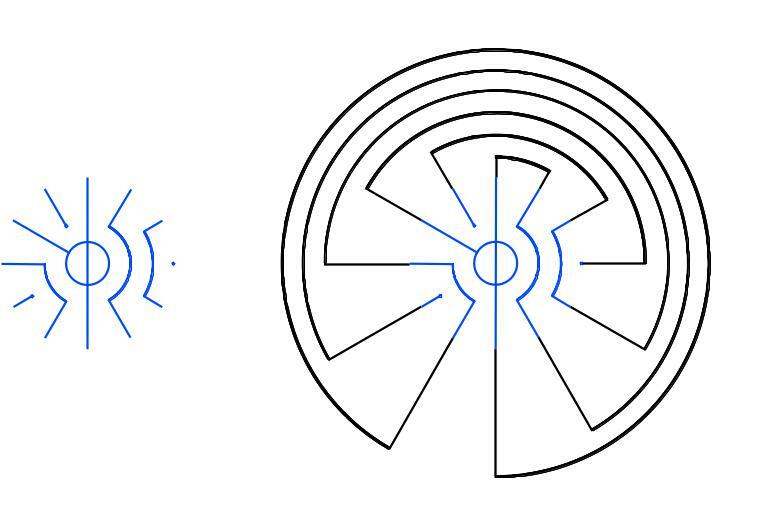 Therefore the auxiliary figure has 8 spokes and consists of three circuits for the labyrinth, one for the center and one more for the seed pattern. For the boundaries of the five circuits, six rings are needed. The other is the well-known Knossos-type labyrinth. The auxiliary figure for this type of labyinth has also 8 spokes. The pattern of this labyrinth, however, is made-up of a single double-spiral like meander (Erwin’s type 4 meander). This has two nested turns on each half of the seed pattern. 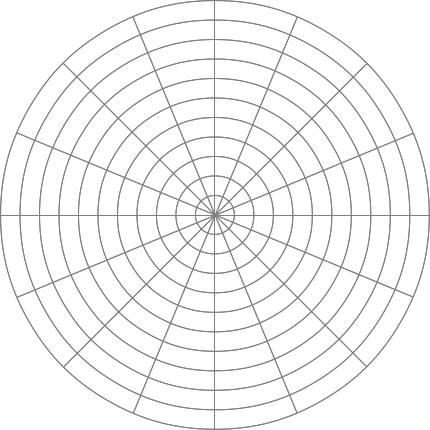 It is this the largest possible seed pattern for a labyrinth with three circuits in the MiM-style. The seed pattern covers two circuits. Therefore, the auxiliary figure for this labyrinth needs 6 circuits / 7 rings, which is one more than the Löwenstein-type labyrinth. As a third example I show the Otfrid-type labyrinth in the MiM-style. Ths seed pattern of this type of labyrinth has 24 ends as is the case with all other labyrinths with 11 circuits. Thus, the auxiliary figure has 24 spokes. In addition the seed pattern consitsts of six similar sixth parts, each of which is made-up of two nested turns. It therefore covers two circuits. The auxiliary figure thus has 11 circuits for the labyrinth plus one for the center and two for the seed pattern, in all 14 circuits and 15 rings. The seed patterns of the Knossos-, Cretan- and Otfrid-type labyrinths all need two circuits in the MiM auxiliary figure. Remember that the Knossos type labyrinth is made-up of one, the Cretan of two and the Otfrid-type labyrinth of three single double-spiral-like (Erwin’s type 4) meanders. These are the three labyrinths of the horizontal line of the labyrinths directly related with the Cretan labyrinth. 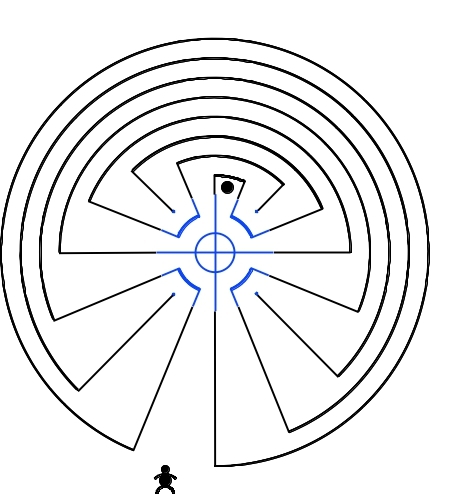 In the two previous posts I have presented the „Cretan“ and the Snail-Shell labyrinth in the Man-in-the-Maze (MiM-) style (see related posts below). Both have the same seed pattern and the same auxiliary figure. If we now try to draw other labyrinths with 7 circuits in the MiM-style, we’ll soon notice, that not all can be matched with the auxiliary figure with 11 rings. Although all have 16 spokes, some of them need less, others more than 11 rings. What’s the reason for that? I will show this with the two extreme examples. 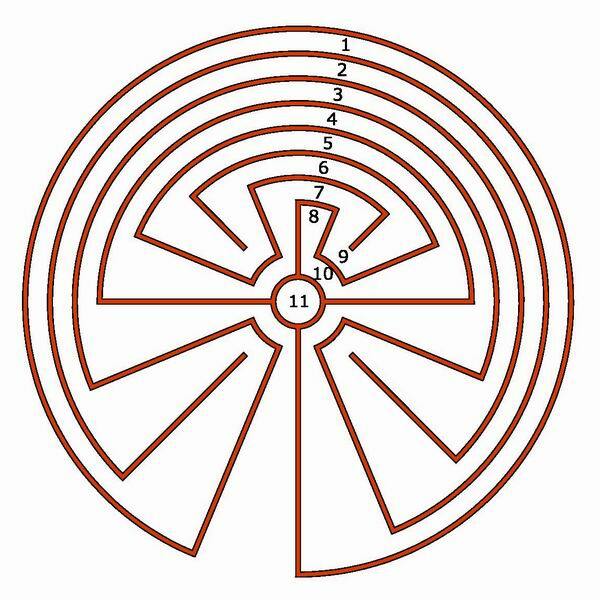 The first labyrinth is comparable with the historical Löwenstein 3 (3 circuits), Näpfchenstein (5 circuits), or Casale Monferrato (6 circuits) labyrinths. I don’t know any historical example of such a labyrinth with 7 circuits. It is one of the 20 uninteresting labyrinths (see related posts below) with 7 circuits, although self-dual. The pattern of this labyrinth is made of a serpentine from the outside in. The seed pattern consists of 8 similar eigth parts. In the auxiliary figure this is the smallest possible seed pattern. This takes one circuit . A labyrinth of this type, drawn in the MiM-style, requires an auxiliary figure with only 10 rings. The second labyrinth is comparable with the historical Knossos (3 circuits), and (the core-labyrinth of ) Rockcliffe Marsh (5 circuits) labyrinths. I am not aware of a historical example of such a labyrinth with 7 circuits either. It is one of the six very interesting labyrinths (see related posts) with 7 circuits. The pattern is made-up of a double-spiral like meander. Whereas the Knossos-type labyrinth consists of a single (Erwin’s type 4) meander and Rockcliffe of a two-fold (type 6) meander, this labyrinth is based on the three-fold (type 8) meander. The seed pattern consists of two identical halves. Each is composed of four nested turns. This is the largest possible seed pattern for a labyrinth with 7 circuits in the auxiliary figure. For this, four circuits are needed. 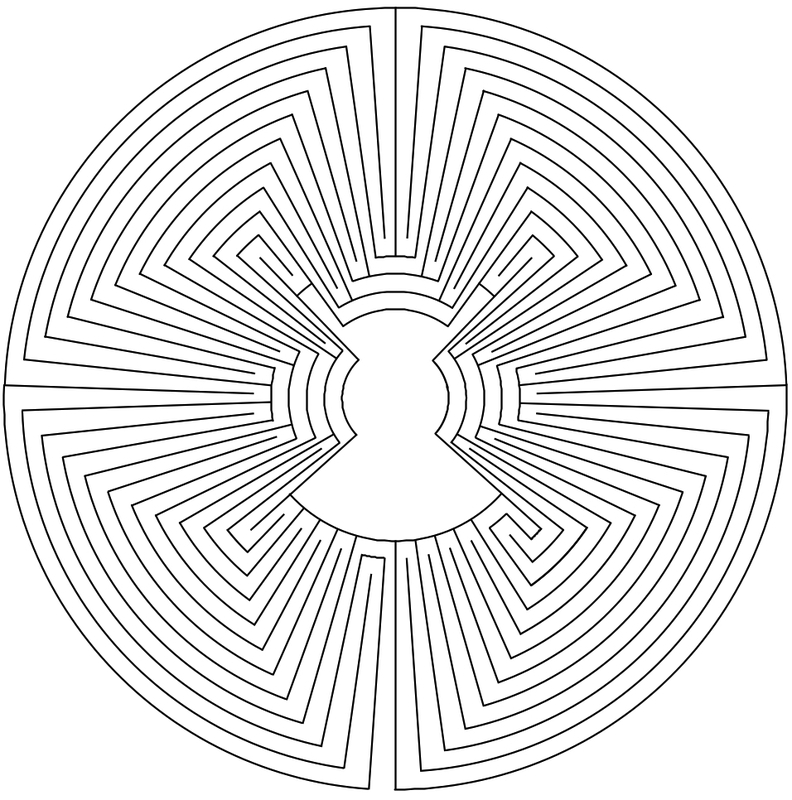 A labyrinth of this type, drawn in the MiM-style, requires an auxiliary figure with 13 rings. Both seed patterns have 16 ends and the auxiliary figures have the same number of spokes. 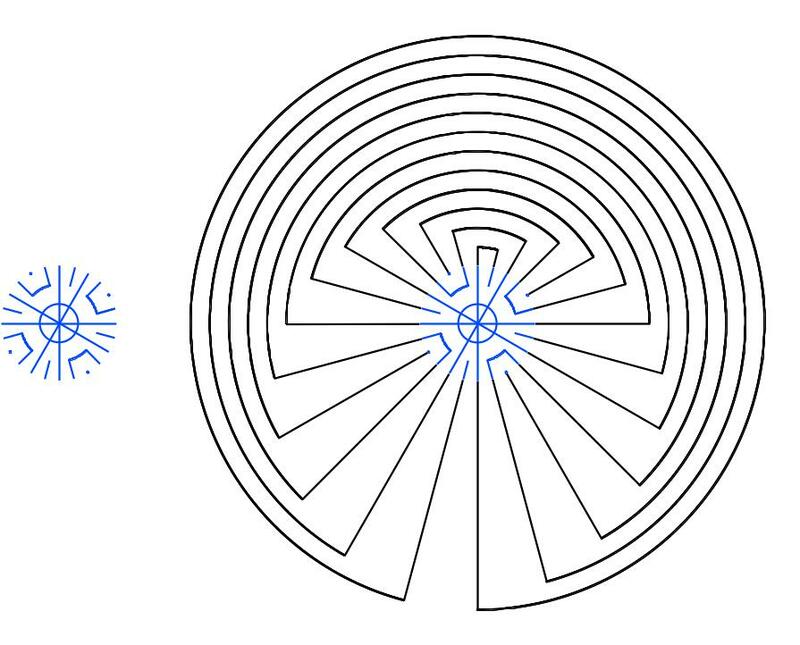 This is the same for all labyrinths with 7 circuits (colored in blue in the figure below). The number of circuits for the seed pattern depends on how deeply nested it is. In a labyrinth with 7 circuits, this can vary from a series of single, not nested, turns up to four nested turns. These two extremes are colored in red in the above figures. The lower extreme requires 1, the upper 4 circuits.